Store the kit at 2–8°C. Storage conditions for aliquots of Standards, Quality Controls and samples are – 20°C. Shelf life of components is 30 days after opening or until the expiration date. Rest of the world: for research use only! The total assay time is less than 3 hours. The kit measures PMN elastase in plasma (EDTA and citrate), exudate, bronchoalveolar lavage fluid, cerebrospinal fluid and seminal plasma. Assay format is 96 wells. Components of the kit are provided ready to use, concentrated or lyophilized. The human organism reacts with an inflammatory response to attacks of invading pathogens (micro-organisms and viruses) or damaged tissue (after accidents or surgery). Polymorphonuclear (PMN) granulocytes play an important role as primary defence cells in this inflammatory reaction. Different bloodstream mediators (cytokines, leukotrienes, complement factors, bacterial endotoxins, clotting and fibrinolysis factors) attract and stimulate these cells to phagocytize and destroy not naturally occurring agents. PMN granulocytes use proteinases to digest these agents and tissue debris. One of these proteinases is PMN elastase which is localised in the azurophilic granules of the polymorphonuclear granulocytes. During phagocytosis of foreign substances these enzymes are also partially excreted into the extracellular surrounding, where the aktivity of PMN elastase is regulated by inhibitors (esp. the α1-proteinase inhibitor, α1-PI). An overwhelming release of PMN elastase, however, can exceed the inhibitory potential of the α1-proteinase inhibitor. Thus, enzymatically active PMN elastase, together with simultaneously produced oxidants (O2-radicals, H2O2, OH-radicals), can cause local tissue injury. Due to the bloodstream and lymphatic system, however, α1-PI is delivered subsequently and eventually able to form a complex with all excreted elastase. 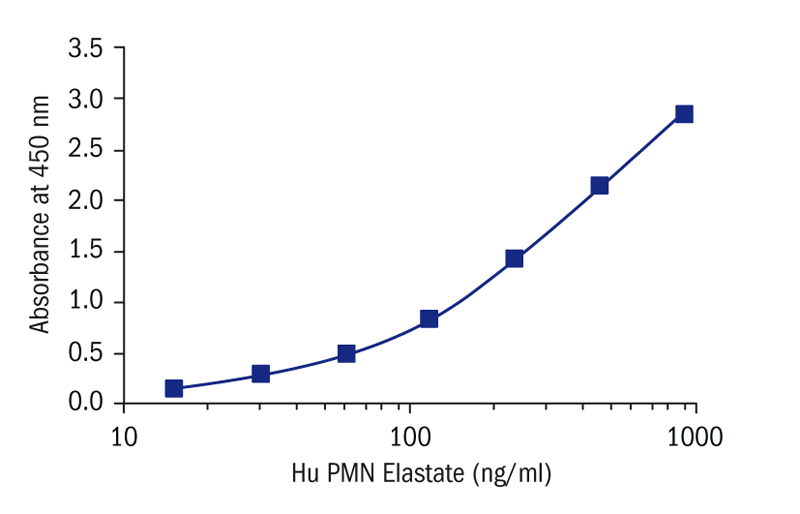 Therefore, the concentration of the PMN elastase/ α1-PI complex correlates with the released PMN elastase and can be used as a measure for the activity of granulocytes during an inflammatory response. Primarily, determinations of PMN elastase find its application in observation of the course of trauma, shock and sepsis. Further indications are the areas of hemodialysis, infections by obstetrics, joint diseases, effusions of sport injuries, intestinal affection, pancreatitis, cystic fibrosis and male adnex affections. Allan EK, Holyoake TL, Jorgensen HG. .